Knut Koivisto는 스웨덴의 저명한 인물 사진가중 한명으로, 엔터테인먼트와 비즈니스 세계를 자유롭게 오가고있다. 인물에 초첨을 두고, 심플하고 세련된 작품을 만들어 낸다. 휴머니스트적인 세계관을 가지고 있어 각자의 특성을 중요하게 여긴다. 그는 다양한 장소에서 강연도 펼치고 있다. 자신의 프로젝트를 진행함과 동시에 새로운 소셜미디어의 리더의 역할도 하고 있다. "가장 중요한 것은 피사체가 되는 인물의 직책이나 입장같은것에 상관없이, 또한 잡념에 정신을 빼앗기지 않고 피사체를 정면으로 마주하는 것이다. CEO든, Mikael Persbrandt 같은 영화 스타든, 간호사든 아무 상관 없다. 그들은 모두 존경받아 마땅하고, 모두 같은 인간으로써 바라보아야 한다. 이러한 자세를 익히는데는 조금 시간이 걸리지만, 반드시 지녀야 하는 중요한 요소이다." My name is Knut Koivisto and I’ve been a freelance photographer since 1997, based in Stockholm, Sweden. I shoot corporate portraits, still photographs in the movie industry and promotional portraits of actors and artists. I am also a teacher in photography, holding workshops throughout the year. I’ve been an X-Photographer since September 2012. I started with the legendary FUJIFILM X100 in 2011, then X-Pro1 in 2012, and it’s been a pure love affair since. They were cameras for just my personal projects in the beginning, but I started to use them in my professional work too as I realized their potential. They fulfill every need I have for a camera system, and for me, they are future proof. Let me give you some background to the Wall of Fame. The photographic scene in Stockholm took a new turn in the late spring of 2010. Brothers Jan and Per Broman (founders of Fotografiska) had envisioned a grand place dedicated to the Art of Photography. They found it in the old royal customs building by Stockholm harbour, designed by legendary architect Ferdinand Boberg a hundred years earlier. On 20 May 2010, Fortografiska was inaugurated. With a total area of about 5500 square meters, it’s one of the largest spaces for photography in the world. Typically there are three major exhibitions of the best photography in the world, going on at the same time. The photographers in Fotografiska’s inaugural exhibition were no less than Annie Leibovitz, Lennart Nilsson, Vee Speers and Joel-peter Witkin. It was almost too good to be true. From a very modest photography scene with just a couple of smaller galleries, Stockholm – at the edge of the North – suddenly had one of the largest photographic venues in the world. Every big exhibition was followed by another, and internationally renowned photographers started passing through Fotografiska, present at each opening. After six months I felt there was a need to document these photographers, many who are heroes of mine. So I approached Jan Broman and said that portraits had to be taken. Jan gave the task to me. Right at that point I started to think through what awaited me. We’re talking about some of the best photographers in the business! Taking a portrait of someone, whoever it might be, is one thing. Taking a portrait of an ace photographer who knows every trick of the trade is something else. You feel completely naked and have nothing to hide behind. You have to trust yourself and your vision. The first portrait I took was of photographer Joel-Peter Witkin, just two days after the opening in 2010. It’s the only one that was shot on film. After that I tried some different digital cameras on some of the early portraits, as FUJIFILM X cameras were still not out on the market. For the first years the photo shoots were very informal: I just brought my camera to the opening of each show and asked the artist if I could make a quick portrait. Each took a couple of minutes and was completely improvised. Fast forward to January 2015. Fotografiska contacted me to say they were going to have a dedicated wall for these portraits, and wanted to know how many I had. The Wall of Fame was to open on Fotografiska’s fifth anniversary in May 2015! I must say I was mightily proud to have my own exhibition of 55 portraits, with most of the elite of the photography world. 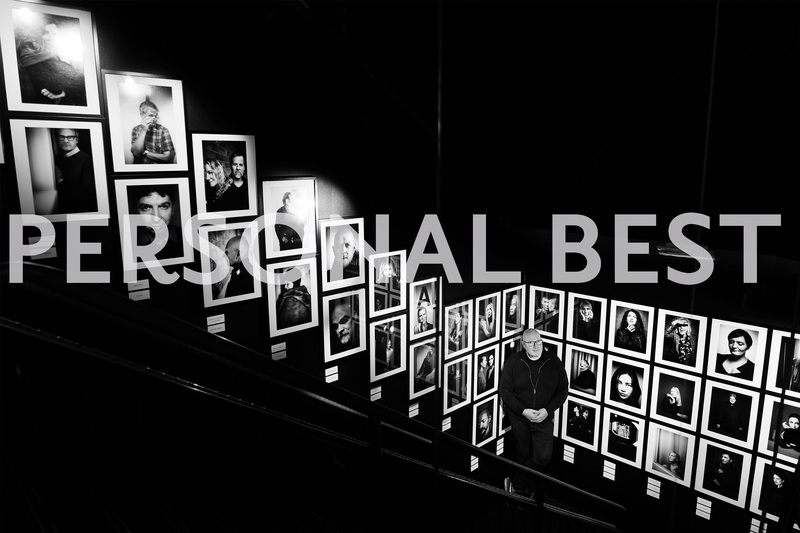 The ”Fotografiska Wall of Fame by Knut Koivisto” has more than 90 portraits now. And since it’s a work in progress, it grows every month. It has already been moved to a new in-house location due to its size. It’s also Fotografiska’s longest hanging exhibition: over 3 ½ years and counting. Each portrait carries its own story. There may be a book in the future, but it will not contain all behind those portraits. There’s the story of Anton Corbijn – a true gentleman and such a nice guy. He’s a major influence on me, so I was almost shaking when I met him. His was the first portrait I took with my brand new X-Pro1 and XF35mmF1.4. After that, I started using the X Series for Wall Of Fame portraits, and those photographs are taken with just about every X camera body ever made. For instance the portrait of Elliott Erwitt was shot on the X-E2. Elliott is a great joker and I love his walking cane with a horn on, just to get people to move out of his way, when he’s on the move. The portrait of Ellen von Unwerth is shot on the X-H1. She was very funny, just like her images. She wanted to know everything of my camera (it was brand new at this point) and also of my lighting which are LEDs for this particular set up. I think I’ll end with my latest portrait, that of the Magnum photographer Jonas Bendiksen. He has been part of the HOME project, a collaboration between FUJIFILM and Magnum Photos which was done on the FUJIFILM GFX 50S. He was also part of the launch of the new GFX 50R at Photokina 2018. At Fotografiska he is exhibiting The Last Testament, his latest photographic project about seven people who claim to be the biblical Messiah returned. So I shot Jonas with my X-T3 as Saint Luke, the patron saint of artists. Most of the portraits in The Wall of Fame are shot on different FUJIFILM X cameras, including the two GFXs. I have also used a variety of FUJINON lenses, but my favorite FUJINON XF35mmF1.4 dominates. It just suits me perfectly. Fotografiska is expanding around the world, opening two new venues in 2019, one in London and one in New York. The founding brothers Broman have promised that more cities will follow. It will be heaven for all of us photography lovers. The portrait of Chen Man was the first I shot on the GFX 50S with the then brand new GF110mmF2, for the Wall of Fame. Chen is probably Chinas most successful fashion and portrait photographer right now. I wanted to make a naturalistic strong portrait of a very young woman looking straight into the eyes of the viewer, both challenging and with confidence, to represent ”The New”. Evelyn Bencicova is at 25 years old probably the youngest photographer I’ve shot for Wall of Fame. Originating from Slovakia and with studies at Universitat for Angewandte Kunst in Vienna, she is already working on personal projects and major international clients. But when she walked into the photo session I was stricken by her beauty. I shot the image on the X-H1 with the FUJINON XF56mmF1.2 APD. Hannah Modigh is highly successful and works mostly with big personal projects that ends up in awarded photo books. As a kid she lived in India due to her parents job and she is a bit enigmatic not wanting to talk too much about herself. In my eyes she’s regal and I wanted to make her queenlike. The portrait made on my X-Pro2 with the FUJINON XF56mmF1.2 APD. I must admit I was nervous when I met Mary McCartney. After all she’s the daughter of my childhood hero Paul McCartney of the Beatles. Her mother, Linda McCartney, was also a successful photographer. Well Mary turned out to be the sweetest person, tall and handsome. You’ve got ten minutes, she said! We did the session in three minutes and every frame usable. This is one of my favorite images of 2018. The camera on this was the X-H1 with the FUJINON XF35mmF1.4. The portrait of Emma Svensson took a couple of years to get together. Emma works all the time shooting fashion and giving workshops in fashion photography, often abroad. She also set out to climb all the highest mountain peaks of every European country. A total of 49 peaks in one year, she’s quite adventures! This portrait was made in my studio when she was about halfway in the climbing and on a short visit back to Stockholm. It was the second portrait I shot on the GFX 50S for the Wall of Fame. I used the GF32-64mmF4 zoom. I’ve been so fortunate through the project to meet both personal heroes and at the same time humble photographers. One such duo is Inez van Lamsweerde and Vinoodh Matadin. They are on the absolute top of the fashion world and I’ve wanted to shoot their portrait for a long time. They collaborate on everything and sign their work with ”Inez and Vinoodh”. I wanted to show them as a unity but at the same time as individuals. The camera for this fashion combo was my at that time camera combo X-T1 and FUJINON XF35mmF1.4.